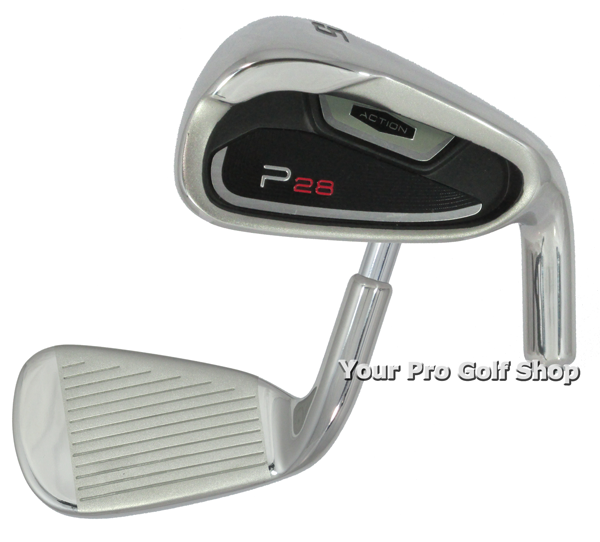 Game improvement design promoting high trajectory, distance, and extreme forgiveness implemented in a sleeker head. Wider sole helps to launch the ball high with distance and forgiveness. Wider sole glides through any lie condition. Mass is moved low to the sole for increased MOI and extreme forgiveness. I9145-3 RH #3 20° 59.25 d 244 7.8 mm 39 in 0.370"
I9145-4 RH #4 23° 60 d 251 7.3 mm 38.5 in 0.370"
I9145-5 RH #5 26° 60.75 d 258 6.6 mm 38 in 0.370"
I9145-6 RH #6 29° 61.5 d 265 5.8 mm 37.5 in 0.370"
I9145-7 RH #7 32° 62.25 d 272 5.3 mm 37 in 0.370"
I9145-8 RH #8 36° 63 d 279 4.5 mm 36.5 in 0.370"
I9145-9 RH #9 40° 63.5 d 286 4.1 mm 36 in 0.370"
I9145-P RH PW 45° 64 d 293 3.6 mm 35.5 in 0.370"
I9145-S RH SW 54° 64.5 d 305 2.8 mm 35.5 in 0.370"